I’m gonna let you guys in on a little secret today. I have a crippling fear of heights. No joke. It’s bad guys. Full blown panic attacks verging on a heart attack before I black out bad. It makes flying a hard no. As much as I want to force myself to get on a plane. I’m terrified of how I’d react once I actually got up in the air, especially if there’s the slightest amount of turbulence. Sadly, my feet will remain firmly planted on the ground- at least for any foreseeable future. That doesn’t mean I don’t long to travel though and experience the world. Different cultures, different cuisines! So while I’m stuck here in my beloved US OF A, I have to a do a lot of experiencing vicariously. Trying to bring these elements home into my own kitchen. Sometimes easier said than done. This is especially true when trying to bring my sons’ and husband’s Italian heritage home for them. A lot can be experienced through taste, including family traditions, recipes, and treasured memories. 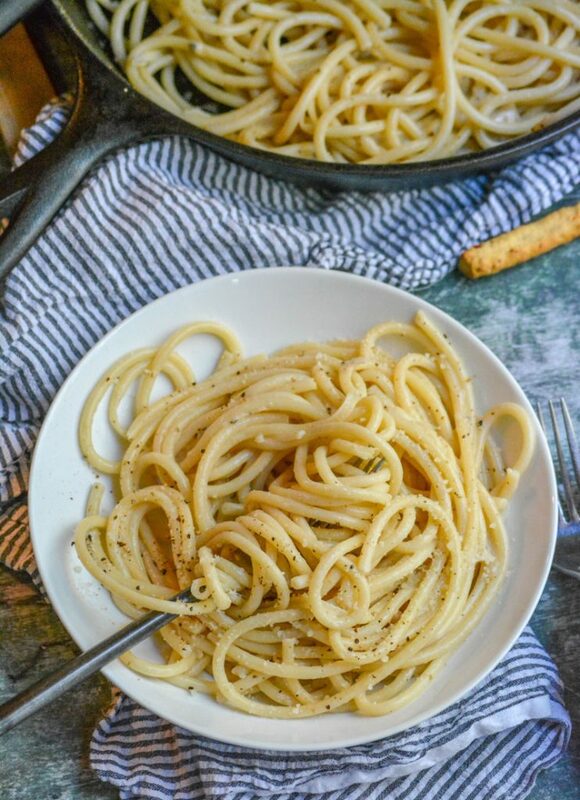 One of those recipes I had my heart set on bringing to our home was this simple, savory Cacio E Pepe. This Italian dish doesn’t actually hail from my family’s native land in Italy. It’s a Roman dish, and the name literally translates to cheese & pepper. It is however, simple but true blooded Italian comfort food in all it’s native glory. So good, that it made it’s way all around the country- all the way to my in-law’s humble supper table. It’s serious comfort food, with one of the shortest ingredient lists I’ve ever encountered. 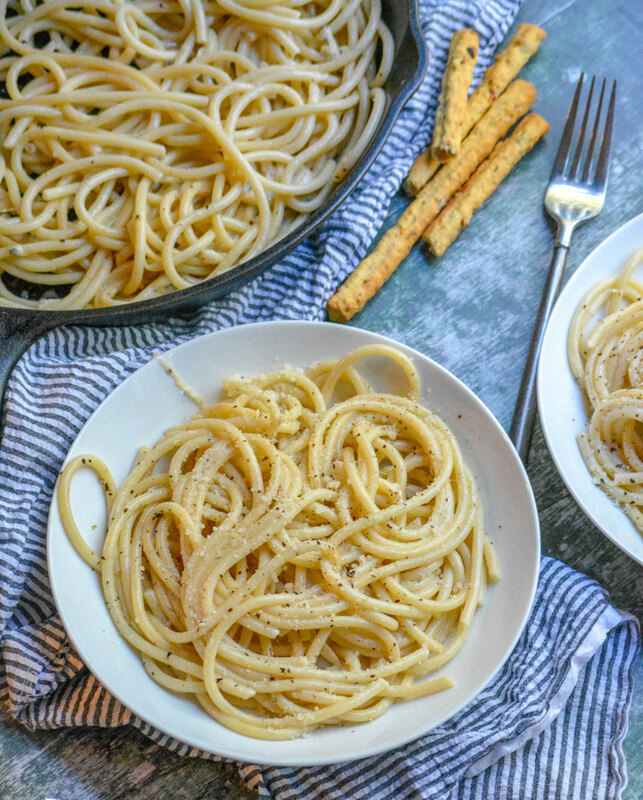 Cacio E Pepe only needs three ingredients. Pasta. Pecorino Romano Cheese. Freshly ground black pepper. Does a creamy, cheesy pasta dish get any better than that? I don’t think so! This is literally the original cozy comfort food. Let’s get started. A large pot of heavily salted water is brought to a boil. Salt away with that water, you can’t add too much salt to pasta water. Promise! Add in the pasta, stirring & cooking until it’s ‘al dente’. While the pasta’s cooking there’s a couple other things we’re gonna be doing. 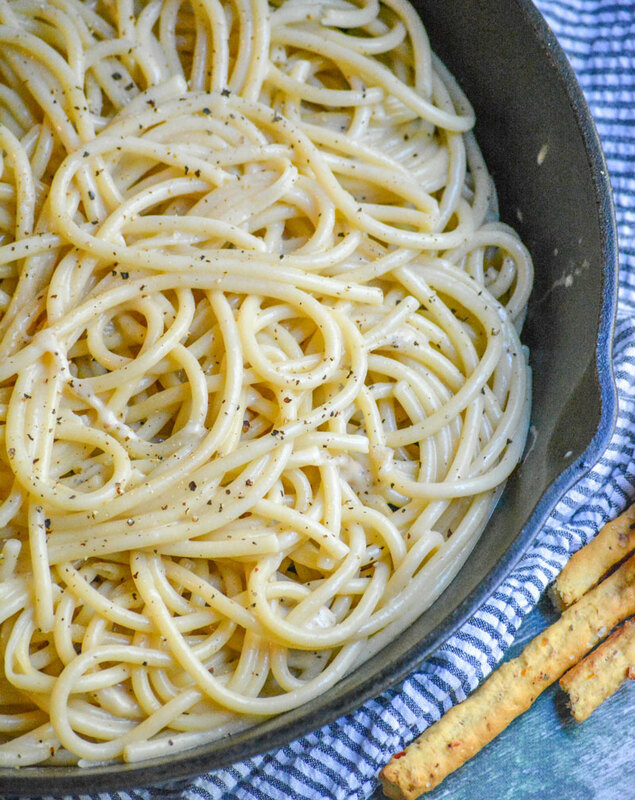 In a large mixing bowl combine 1 1/2 cups romano cheese, the pepper, and 1/3 cup of pasta water. Don’t skip that last step and spring for tap water. 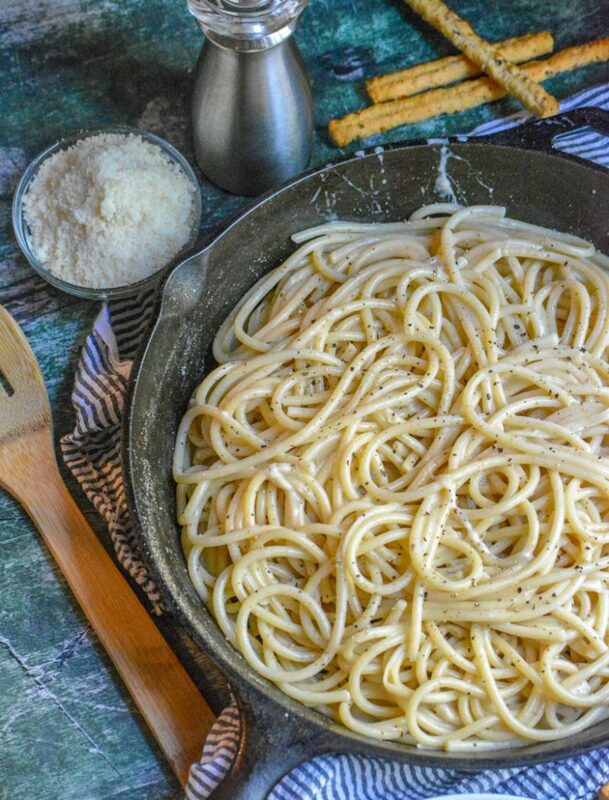 You need to use the pasta water since it’s full of starches from the cooking pasta that will help your simple cheese sauce combine. It’s a glue of sorts. Using the back of a solid wooden spoon mix everything together, stirring vigorously, to form a paste. As soon as the pasta’s done use a slotted spoon to transfer it from the pot to the mixing bowl with the cheese paste. Once it’s all transferred, toss it all together to evenly combine. Add extra pasta water, a tablespoon at a time, if needed to get the sauce to come together around the pasta. 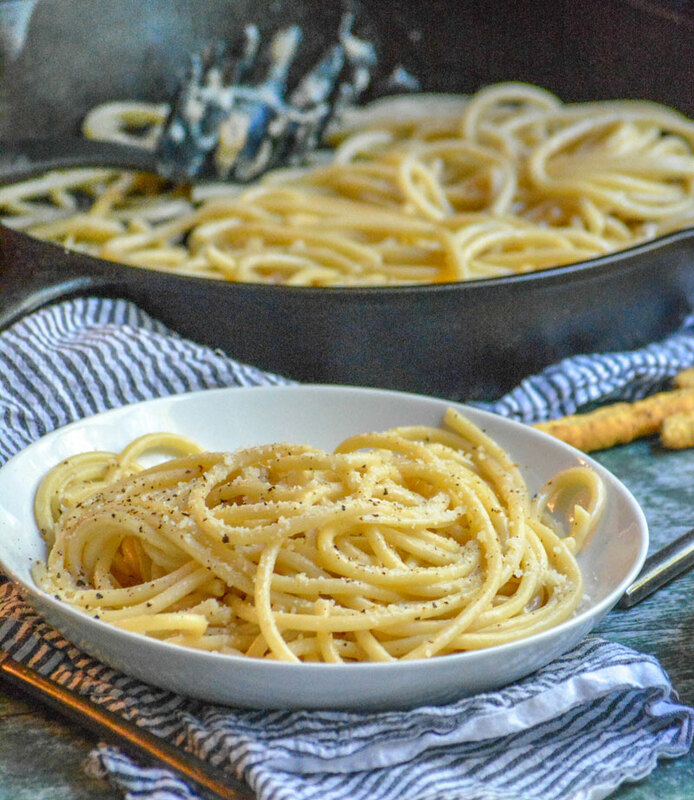 Serve the pasta immediately, topped with extra pecorino romano & freshly cracked black pepper. Voila. That’s what pasta dinners were always destined to be. There’s beauty in the simplicity. One bite, and you’ll agree. 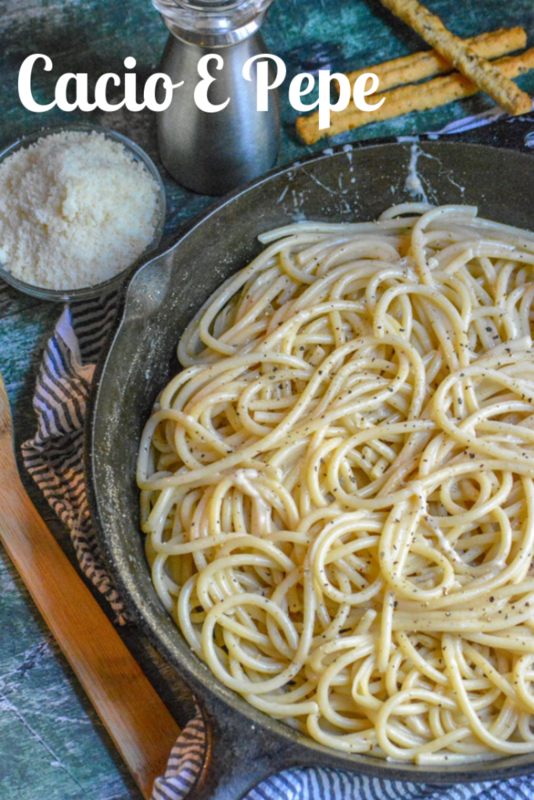 Cacio E Pepe is about to be the new, old trend in pasta dishes, no tomato laden sauce included. It’s true what they say about everything old becoming new again. Thank goodness for us all! Bring a large pot of heavily salted water to a boil, add the pasta, stirring occasionally until the pasta's cooked to al dente. In a large mixing bowl, add 1 1/2 cups of the pecorino romano cheese, the pepper, and 1/3 cup of the pasta water. Use the back of a solid spoon, to mix heavily & quickly, to form a paste. Once the pasta's done, use a slotted spoon, quickly remove it from the water. Transfer it to the large mixing bowl, with the cheese paste. Toss the pasta until a creamy cheese mixture sauce has been formed. Add extra pasta water, a tbsp at a time if necessary to get it to come together. 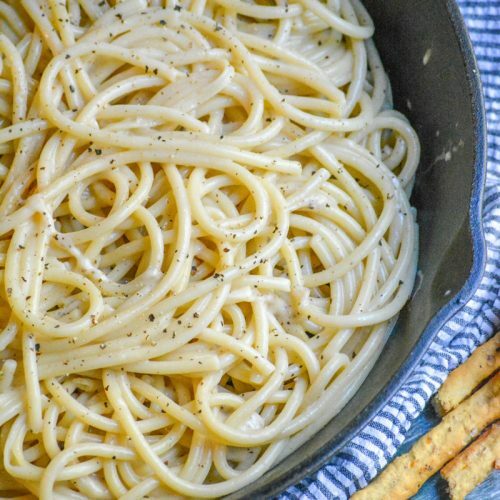 Serve immediately, sprinkled with extra romano cheese & freshly cracked black pepper. What is pecorino romano cheese? It’s an old cheese that originated in ancient Rome, and is still common today. It’s salty and hard, made from sheep’s milk, and should be in the cheese section of your grocery store, either in a chunk or already grated. How does pecorino romano cheese taste like? Is it close to parmesan/parmigiano? Or can you use another type of cheese? I don’t think I’ve had it before, but this pasta looks like something I’d really love. Thanks for sharing at Fiesta Friday party. Yummm! 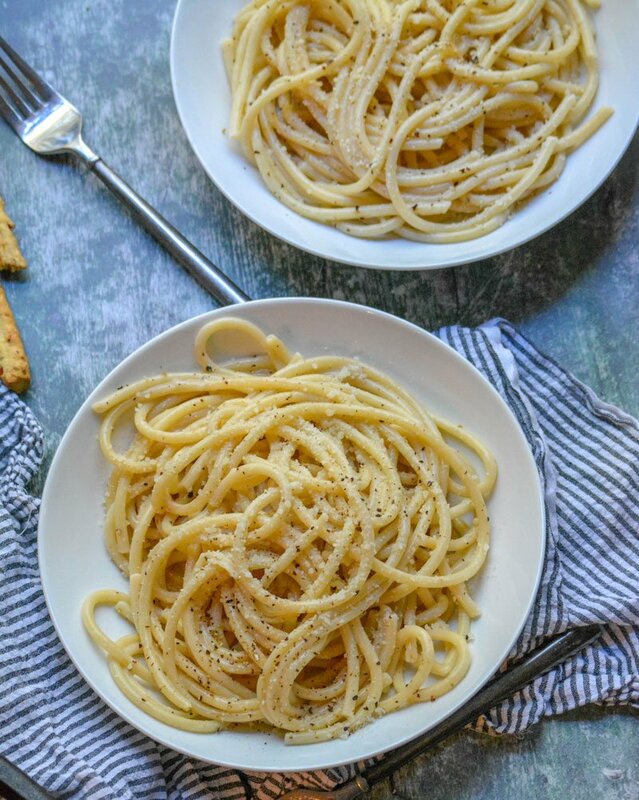 I love cacio e pepe! Well, all pasta really haha. Oh, I have a fear of wasps and horseflies. I don’t black out like you with heights, but I definitely have the full-blown panic attacks.